I bet that unlike Sonic's family who shares lots of affection and love, they would be, of course, less and less kindhearted and careless persons. Being /anti/ doesn't mean to be /evil/, but their personality and actions, the way they do in psychical and psychological ways. To clear things up, there's no such history of them, Archie Issues never created, so I only used my mind to imagine what was like in Scourge's past and built up some theories regarding his situation and his family as well. If you don't like it, then why don't you just go and write your own story as well? Anti-Jules: Most of guys probably thought Scourge could've got this attitude from his father's evilness, which not really cause, since Anti-Jules was considered as a leader of Great Peace, he never showed any dangerous expressions. (There's only a single existent photo of him from Archie Issues.) According to the wiki he never paid any attention to his son. Despite of Scourge's big efforts, he only cared for his serious business. He'd rather meet up with people than playing around with his son. I think everything started when his wife passed away while Scourge was becoming a toddler. He never realized what a family was like, not in that day when he was killed and had first regrets. Sometimes when Scourge was away he was caught mourning over his wife. 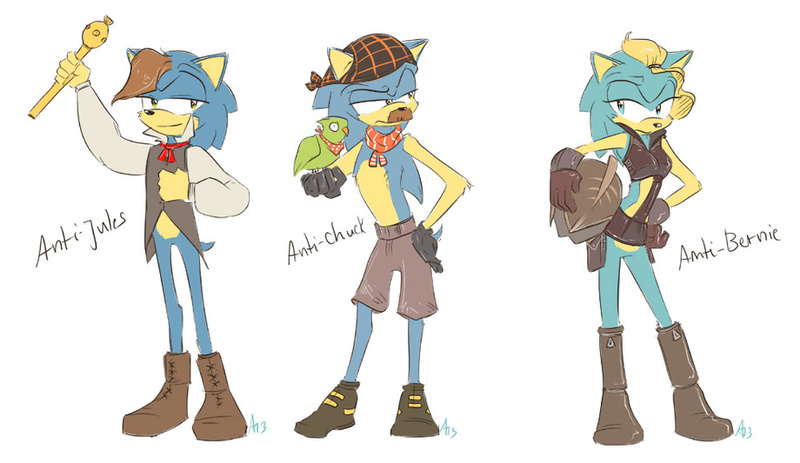 Anti-Chuck: Kind of pirate eh? Not a real thingy, but I thought it would be his style to wear like that. And that parrots would be his fave bird. Unlike Uncle Chuck, he would love go fishing, do affairs with other guys or collect any traditional things. He does like cooking, but no chili dogs lol. Either that way. Since his little bro was coupled with Anti-Bernie, he never liked that girl, because of it he had difficulties in his brotherly relationship that soon he decided to leave when Anti-Bernie was pregnant. He used to be a good brother and always on his little bro's side when their father was in bad mood. After a few years since the bros broke their contact, he was called surprisingly by Anti-Jules who begged him to take care of Scourge for a while. He never liked the idea, like Anti-Bernie he always hated this little brat, though he had to go since his wife died couples of days ago. Even if Anti-Jules wasn't there to share comfort, at least he didn't want to, Anti-Chuck sighed and showed very little affection to his anti-nephew for the first time. Unfortunately it didn't last anylonger. Probably he couldn't stand anymore it and left. He won't see him than many years later when Scourge decided to learn some about his past. Anti-Bernie: Oh god....What if she was ever a part of gang? Her influence over his son would be obvious or Scourge could've had it in his blood. Who knows? She is a smoker and always hang out with random guys to race with by her smexy motorcycle. Recently she had financial troubles as she was desperate trying to fine some good jobs. When she couldn't find out she decided to go to one of best cafe and there she met Anti-Jules. She thought this guy could be her chance so she started flirting with him. Anti-Jules who was never aware of the whole thing fell in love with her. Her love for him would've increased up once she found out she was pregnant and when she saw that he really wanted to help her, that he really didn't have the huge hunger for money unlike guys she met till now. Meanwhile that she started to know his big bro, though these things didn't take so well. She and Anti-Chuck used to hate and not trust each other. When the familial problems came, Anti-Jules warned his big bro that he'd throw him out of his home if threatening his lover ever. When she gave birth to his son she refused to accept this idea of having kid. A few days before his death, she was overwhelmed by what his son, in process of becoming a toddler, has done: a drawing of them with rough written letters: Family. It filled emotions and nostalgia. So after that she hugged him affectionately and called him "most precious baby ever". Maybe that's how she got this flashback when she was little and she regretted not having moments with his son? She even tried to convince Anti-Jules, though he didn't seem to care about that. In the end while riding on her motorcycle she has been in her deep thoughts untill someone, or maybe one of her friends, tried to make her snap out. The truck suddenly lost its control and slid in her way. She sadly didn't survive in a car crash. The tragedy would have changed Jules's life forever.